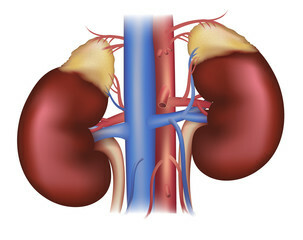 The kidneys are two bean-shaped organs that is an essential organ of the body. It removes wastes and extra water from the blood to form urine.The kidneys are important organs with many functions in the body, including producing hormones, absorbing minerals, and filtering blood and producing urine. They are located in the back of the abdomen. Good kidney function is essential to any healthy body. Make hormones that helps regulate blood pressure, make red blood cells and makes bones stay strong. The main job of our kidneys is to regulate erythrocyte balances and drain metabolic waste from the body. If the body is not properly hydrated, the renal blood flow decreases, resulting in accumulation of toxins in the blood. Concentrated, dark-colored urine is a sign that your kidneys are retaining fluids to maintain your bodily functions, and is a good indication that you need more water. Ideally, you’ll want to drink enough water to turn your urine a light-colored yellow. It’s important to recognize that your body loses water throughout each day, even when you’re not sweating, and that you need to constantly replenish this fluid loss. So, increase the rate of your water intake to help your kidney. Keeping your urine in your bladder for too long is a bad idea. A full bladder can cause bladder damage. The urine that stays in the bladder multiplies bacteria quickly. Once the urine refluxes back to the ureter and kidneys, the toxic substances can result in kidney infections, then urinary tract infections, and then nephritis, and even uremia. If you hold it in too frequently, you could be more likely to develop long-term urinary tract symptoms like frequent and painful urination. When we drink alcohol we often ignore the proper quantity suitable for good health. Too much alcoholic intake is a habit that can severely damage your kidneys. Alcohol is full of toxins that stress our kidneys thus damaging them. Alcohol can cause changes in the function of the kidneys and make them less able to filter your blood. Diabetes occurs more often in people who sleep less, as does high blood pressure,and we know that two of the greatest factors that decrease kidney function are diabetes and high blood pressure. During the night when you sleep, the organs tissues are repairing themselves. Therefore, every time you don’t get good quality sleep, the renewal process is interrupted, resulting in damage to the kidneys and other organs. Caffeine may be the most common drug in the human food supply. That mug of breakfast coffee, the cup of tea in the afternoon and the energy drink or cola on a hot day all contain caffeine. You may think of caffeine as a mild stimulant and use it for that purpose, but caffeine affects the whole body, including your kidneys. It is common that whenever we are thirsty we choose to drink other beverages like sodas and soft drinks rather than water. Many of these beverages contain caffeine. High blood pressure puts strain on the kidneys which can damage them, and caffeine can elevate blood pressure. The Centers for Disease Control and Prevention stated that smoking is bad for almost every organ of the body, including the kidneys. Smoking can interfere with medicines used to treat high blood pressure. Uncontrolled or poorly controlled high blood pressure is a leading cause of kidney disease caused by smoking. Also, smoking slows the blood flow to vital organs like the kidneys and can worsen already existing kidney disease. Regularly intake of too much salt can also cause huge damage to your kidneys as well as other health problems. When salt intake is high, the kidneys need to work harder to excrete the excess salt. This in turn can lead to decreased kidney functioning, causing water retention in the body. Water retention can cause a hike in blood pressure and increase the risk of developing kidney disease. Share this with your friends, you might save a life, who knows ? Your comments and ideas are needed. Try to improve on them, it will really improve your well being. Thanks for visiting Sound Health Doctor. It's true people take them for granted, that's why i took my time to write this to enlighten people. Help to share to friends and family so as to make them learn too. Yes Odafe, you made a nice point. It happens on daily basis because people do not know about it. Share to your friends and family so that they can learn too.